Vonageâ€™s subscriber growth has exploded over the past few years, but how many of those customers realize how vulnerable their calls are to eavesdropping by third parties? Vonage, like many other VOIP providers, uses SIP for call signaling and several RTP codecs for the audio portion. Vonage goes to great lengths to encrypt the configuration files used on the ATA adapters, but NO encryption is used on the audio portion of a call. Anyone with access to the RTP packets and the proper codec can monitor and record Vonage calls. This video tutorial walks you through the process of intercepting and monitoring Vonage calls on your network. Access to the same IP Subnet as the Vonage Adapter. A working install of Cain. 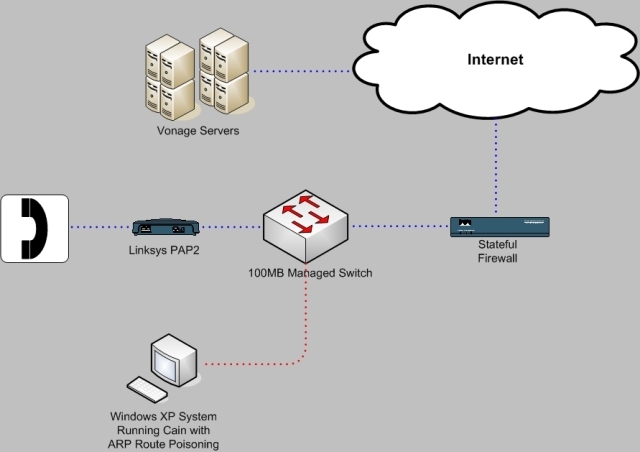 The following diagram details the network configuration used for the tutorial. This entry was posted	on Monday, July 10th, 2006 at 12:19 am	and is filed under Voice Over IP. You can follow any responses to this entry through the RSS 2.0 feed. Both comments and pings are currently closed.